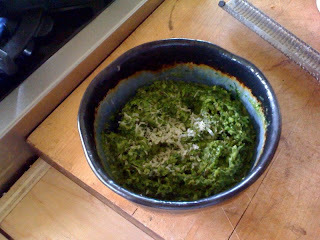 Here is what ramp pesto looks like. It has walnuts instead of pine nuts and no garlic or basil but other than that it is the same as regular pesto. And I only used the leaves of the ramps. It is delicious. I make pestos all year, the parsley or cilantro kinds in the winter but have never tried this before. As soon as I made it I cooked some rice pasta (trying to cut out glutens), chilled it down and threw on a blob. A perfect little Sunday lunch. Yesterday I swirled it on soup. Today I schmeered it into a bowl of sauteed vegetables for lunch. Make hay while the sun shines. I'd never heard of ramps before today. I've gotta try pea pesto! Love peas!